The first Purple Gallinules I found at Orlando Wetlands Park in Christmas, Florida were on the wrong side of the dyke, moving against the sun, all but silhouetted. Tricky exposure, but with some +EV and some creative post-processing (including some luminance masking in Polarr), it was possible to get the shots, and bring out most of the color in the birds. 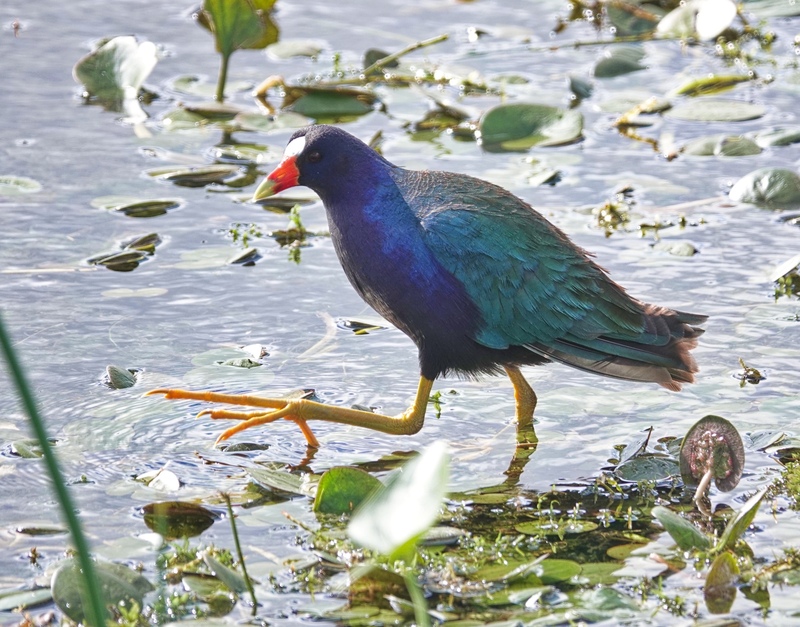 I like this one because it shows the amazing foot of the Gallinule…made for walking on floating water plants. Sony RX10iv at 600mm equivalent. My birds and wildlife modifications to Program mode. 1/320th @ f4 @ ISO 100. +1EV. Processed in Polarr.